The present invention relates to a coextruded chewing gum and more particularly to a coextruded chewing gum which includes a center gum portion or core which has a very soft texture. Until now, it has not been possible to handle such soft chewing gums in conventional gum wrapping machines. Generally, the softness of chewing gum is directly related to the amount of moisture or other liquids contained therein. Although it is desirable to increase gum softness so as to enhance bite-through and chew properties, the degree of softness of commercial chewing gum has been severely restricted due to manufacturing and packaging problems. It has been found that where moisture content of the chewing gum is greater than about 3.5%, the chewing gum tends to sweat and become unacceptably sticky and tacky and thereby tends to bind up wrapping machines; if successfully packaged, the soft chewing gum tends to stick to its wrap especially during the warm seasons. FR-A-2415964 relates to a composition to be incorporated as a sugarless liquid filling in a center filled chewing gum comprising a natural or synthetic gum, glycerine as a moisturizing agent and additionally a sorbitol solution alone or in combination with propylene glycol. However, a need still exists for a chewing gum which has a soft consistency and yet is capable of being manufactured and packaged using standard equipment. In accordance with the present invention, a chewing gum is provided which may be manufactured and packaged using conventional equipment and yet may have a soft consistency without unduly sticking to such equipment or to its wrapper. The invention relates to a coextruded chewing gum having a soft gum center portion, comprising an extruded soft gum core portion and an outer shell portion formed of chewing gum and extruded simultaneously with said core portion, said core portion formed of chewing gum containing more than 5 to 10% by weight moisture based on the weight of the core portion and containing therein a preformed recrystallized sweetener combination including at least two sweeteners which have been recrystallized as a mixture, dispersed as said recrystallized mixture in said gum base, said outer shell portion being bonded to said core portion to provide a support and protective barrier therefor to retain said moisture in said core portion and retard migration of moisture therefrom. In a preferred embodiment of the invention, the core portion will contain from 6 to 8% by weight moisture, that is, amounts of moisture not normally employed in all-solid chewing gums. Although the core portion is, of itself, soft, sticky and difficult to handle, through co-extrusion techniques, the outer shell layer acts as a support and protective coating for the soft and sticky inner core portion. The present invention also includes a method for forming the coextruded chewing gum described above which method includes the steps of providing a soft chewing gum (as described above) for the core portion which chewing gum contains more than 5% to 10% by weight moisture based on the weight of said core portion, providing a chewing gum for the outer shell portion, extruding a rope of the chewing gum comprising the soft gum core portion, and simultaneously extruding a rope of the chewing gum comprising the outer shell portion about the extruded core portion to completely surround and form a protective barrier around and bonded to the core portion and thereby retard migration of moisture from the core portion to the outer shell portion. Although the core gum portion is too soft to adequately manipulate same into the desired product form and perhaps to wrap same without sticking, these problems are overcome by the method of the invention since the outer shell portion is bonded and is supportive of the less manageable soft core portion before handling or packaging of the core portion. The coextruded chewing gum of the invention will comprise from 5 to 90% by weight and preferably from 40 to 75% by weight of the soft core portion, and from 10 to 95% by weight, and preferably from 25 to 60% by weight of the outer shell portion. Thus, the core portion will be in a weight ratio to the shell portion of within the range of from 0.05:1 to 9:1, and preferably from 0.67:1 to 3:1 whereby the outer shell will coat and protect the core portion and prevent moisture from migrating to the shell portion and subsequently into the atmosphere. The soft gum core portion will preferably be formed of a sugar containing chewing gum, although soft sugarless chewing gums may be employed as well. In a preferred embodiment of the invention, the sugar containing soft gum core portion will have a short nougat-like or fondant-like structure, a long-lasting sweetness, a soft and smooth consistency, an amorphous bite through and easy chew and because of its high moisture content (from over 5 to 10%, preferably from 6 to 8% moisture) will be sticky and tacky and therefore difficult to package. The chewing gum forming the outer shell portion may comprise chewing gum formulations generally known in the art. Each of the core and shell chewing gums may be of the sugar-containing or sugarless variety. Thus, in the sugar-containing coextruded chewing gum of the invention, both the core and outer shell portions may be sugar-containing or one may be sugar-containing and the other sugarless. For example, a coextruded chewing gum of the invention having an initial sweet taste and while still providing prolonged sweetness, may include a sugar-containing outer shell portion as disclosed in U.S. Patent No. 4,217,368, which provides for initial sweetness impact; the composition of the soft core portion is described elsewhere. A preferred sugarless chewing gum for the outer shell portion is disclosed in U.S. Patents Nos. 4,064,274 and 4,085,227 and in U.S. Patent No. 4,217,368. The soft core portion is preferably formed of gum base, a premixed recrystallized combination of at least two sweeteners, including one or more solid and one or more liquid sweeteners which coat said solid sweeteners, which preferably include sucrose and/or sorbitol and/or hydrogenated starch hydrolysate, and high fructose syrup alone or together with liquid glucose, hydrogenated starch hydrolysate syrup, corn syrup, sorbitol syrup and/or invert sugar, in the recrystallized mixture, and flavors, softeners and other conventional chewing gum ingredients. A preferred recrystallized mixture comprises sorbitol and sorbitol syrup or hydrogenated starch hydrolysate. It is essential that the liquid and solid sweeteners mentioned above comprise a preformed combination of a particulate solid sweetener particles of which are coated with a syrup sweetener and which mixture has been heated, dried to a homogeneous mass, and then cooled to recrystallize the mass into an amorphous solid. The recrystallized sweeteners impart a soft smooth consistency and texture to the chewing gum, similar to that found in nougat-type or fondant-type candies. Furthermore, the above premixed combination of sweeteners may comprise a so-called "dry fondant" mix formed of the above mentioned sweeteners which is reconstituted with water and then added to the gum base and other chewing gum ingredients to form the soft chewing gum core portion of the coextruded chewing gum of the invention. 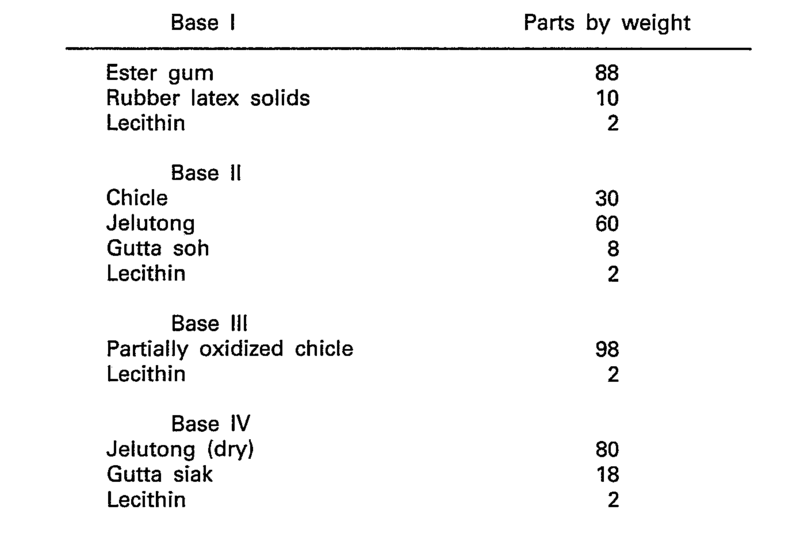 The preferred soft chewing gum core portion of the coextruded chewing gum of the invention comprises a sugar-containing chewing gum which includes gum base in an amount within the range of from 12 to 40% and preferably from 15 to 35% by weight of the chewing gum, which includes the preformed recrystallized combination of liquid and solid sweeteners comprising from 40 to 85%, and preferably from 60 to 80% by weight of the chewing gum. The preformed sweetener combination will comprise solid sweeteners, such as sucrose, lactose, maltose, sorbitol, fructose, dextrose, arabinose, xylose, ribose, mannose, galactose, hydrogenated starch hydrolysate, or mixtures of two or more of the foregoing, and liquid sweeteners, such as any of the above dissolved in water, such as corn syrup, sorbitol syrup, fructose syrup, invert syrup, glucose syrup, hydrogenated starch syrups, and the like. The above syrups will preferably contain from 50 to 99% by weight solids and preferably from 70 to 90% by weight solids. The solids and liquids will be employed in the preformed sweetener combination in a weight ratio to each other (solids:liquids) of within the range of from 1:1 to 30:1 and preferably from 2:1 to 19:1. It is theorized that upon pre-mixing of the solid sweeteners and liquid sweeteners, the crystals of solid sweetener, such as crystals of sugar, are reduced in size, becoming more round, more smooth and slippery, and thereby contributing to the soft easy bite through and fondant structure of the soft chewing gum core portion. This is indeed surprising and unexpected inasmuch as this effect is opposite to the usual behavior of powdered crystals added to water wherein there is an apparent coarsening effect due to preferential solubility of fine crystals. Particularly preferred preformed sweetener combinations, wherein a solid sweetener is coated with a syrupy sweetener, comprise from 35 to 95% sucrose (or sucrose dissolved in water) as the solid sweetener and from 5 to 50% high fructose syrup (containing from about 40 to 90% fructose), alone or in combination with from about 1 to 30% liquid glucose, from 1 to 30% corn syrup, from 1 to 25% invert sugar, all of the above % being based on the weight of the preformed combination of solid and liquid sweeteners. In such preferred combinations, the solid sweetener will be employed in a weight ratio to the liquid sweetener of within the range of from 1:1 to 30:1. A particularly suitable coextruded chewing gum is one, wherein said core portion is free of corn syrup and said core portion comprises gum base, pure fructose syrup, sweetener-bulking agent and flavour and containing no additional humectant, said fructose syrup being present in an amount from 8 to 30% by weight of said core portion. A preferred sweetener-bulking agent is sugar or sorbitol in an amount within the range of from 30 to 80% by weight of said core gum portion. In the coextruded chewing gum of the invention it is a preferred embodiment when said core or outer shell portion is formed of chewing gum which provides fast flavour and sweetness release, while the other of said portions is formed of chewing gum which provides slow initial but prolonged sweetness or flavour release. The hydrogenated starch syrup also referred to as hydrogenated starch hydrolysates, which may be employed herein may include those disclosed in Reissue Patent No. 26,959 or U.S. Patent No. 3,556,811 as well as various hydrogenated glucose syrups and/or powders which contain sorbitol, hydrogenated disaccharides, hydrogenated tri- to hexa-saccharides, and hydrogenated higher polysaccharides, or mixtures of any two or more of the above. The hydrogenated glucose syrups and/or powders may be produced by catalytic hydrogenation of standard glucose syrups (acid and/or enzyme converted) to the point where all the glucose end groups of the saccharides are reduced to alcohols, that is, dextrose end groups to sorbitol end groups. In the case of hydrogenated glucose syrups, the total solids are made of from about 4 to 30% sorbitol, from 5 to about 65% hydrogenated disaccharides (that is, maltitol), from 15 to 75% tri-to hepta-hydrogenated saccharides, and from 1 to 65% hydrogenated saccharides higher than hepta. Examples of particularly suitable hydrogenated starch hydrolysates include from 6 to 10% sorbitol, from 25 to 55% hydrogenated disaccharides, from 20 to 40% hydrogenated tri- to hepta-saccharides, and from about 15 to about 30% hydrogenated saccharides higher than hepta. Another example of suitable hydrogenated starch hydrolysates include from 8 to 20% sorbitol, from 5 to 15% hydrogenated disaccharides, and from 2 to 75% hydrogenated tri- to penta-saccharides. Particularly preferred are hydrogenated starch hydrolysates of the following compositions. The hydrogenated starch hydrolysate as described above may be employed as a substitute for corn syrup, fructose syrup or other plasticizer or softener, sugar and even sugar alcohols. The soft core gum portion will include a relatively water-insoluble, water-impenetrable gum base in an amount ranging from 8 to 50%, and preferably from 15 to 40% by weight of the chewing gum composition. The soft core gum portion may also include flavoring, such as sour or fruit flavoring or non-acid or mint flavoring in an amount ranging from 0.3 to 2.0% by weight, and preferably from 0.5 to 1.2% by weight of the final gum product. The flavoring may comprise synthetic flavors and oils derived from plants, leaves, flowers, fruit, etc. Representative flavor oils of this type include acids such as adipic, succinic and fumaric acid, citrus oils such as lemon oil, orange oil, lime oil, grapefruit oil, fruit essences such as apple essence, pear essence, peach essence, strawberry essence, apricot essence, raspberry essence, cherry essence, plum essence, pineapple essence, as well as the following essential oils: peppermint oil, spearmint oil, mixtures of peppermint oil and spearmint oil, clove oil, bay oil, anise oil, eucalyptus oil, thyme oil, cedar leaf oil, cinnamon oil, oil of nutmeg, oil of sage, oil of bitter almonds, cassia oil, and methylsalicylate (oil of wintergreen). Various synthetic flavors, such as mixed fruit, may also be incorporated in preservatives. As indicated, the soft gum core portion may also include a natural sugar including any of those set out hereinbefore in the listing of solid sweeteners employed in the preformed combination, as well as a non-sugar or artificial sweetener employed in conjunction with the preformed sweetener combination. Examples of artificial sweeteners (also referred to as non-sugar sweeteners or sugar substitutes), which may be employed herein include poorly or readily water-soluble sweeteners, such as the free acid form of saccharin, sodium, calcium or ammonium saccharin salts, dihydrochalcones, glycyrrhizin, dipotassium glycyrrhizin, glycyrrhizic acid ammonium salt, L-aspartyl-L-phenylalanine methyl ester, the sodium salt or potassium salt of 3,4-dihydro-6-methyl-1,2,3-oxathiazine-4-one-2,2-dioxide (Ace-sulfame-K) as well as Stevia rebaudiana (Stevioside), Richardella du/cifica (Miracle Berry), Dioscoreophyllum cumminsii (Serendipity Berry), free cyclamic salts, and the like, or mixtures of any two or more of the above. The soft gum portion may also contain other miscellaneous ingredients, such as conventional ester gums, polydextrose, fillers, such as calcium carbonate, and texturizers, such as hydrated alumina, plasticizers, softeners or emulsifiers, such as lecithin, fatty acids, glycerin, glyceryl monostearate, hydrogenated vegetable oils, sorbitan monostearate, tallow, isomaltitol, propylene glycol. F.D.&C. coloring agents, and other conventional chewing gum additives as will be apparent to those skilled in the art. The soft gum core portion may be prepared by the following procedure. The preformed recrystallized sweetener combination is first prepared by heating a mixture of the solid sweetener (e.g., powdered sugars or liquid sugars in water) and the liquid sweetener (e.g., high fructose syrup, liquid glucose, corn syrup, invert sugar, or a mixture of two or more of the above) at a temperature within the range of from 93 to 127°C (about 200 to about 260°F), and preferably from 110 to 121°C (about 230 to about 250°F), with or without stirring, to form a homogeneous mass, and then cooling the homogeneous mass, for example, by exposing to ambient air or a cooled surface. One or more conventional techniques are employed, such as seeding or stirring to cause the sweeteners to recrystallize and form an amorphous mass. As indicated, reconstituted "dry fondant" mix may also be employed. The soft gum itself is prepared by mixing melted gum base (heated at, for example, 71 to 79°C) (160-175°F) and color, adding about one-third of the preformed sweetener combination and mixing for 1 to 3 minutes, adding a second one-third portion of preformed sweetener combination to the mixture and mixing for 1-2 minutes, adding softener and moisture retaining substance, such as corn syrup solids, and mixing for 1-2 minutes, adding softener, such as lecithin, and flavor, and mixing for 1-2 minutes, and then adding the remaining portion of preformed sweetener combination with stirring, and then optionally adding spray-dried flavor and mixing the entire mass for 2 to 5 minutes. If desired, the above may be mixed with one or more easily extractable water-soluble sweeteners, such as natural sugar, soluble saccharin salts, aspartame, Ace-sulfame-K, water-soluble food acid and/or flavors. The resulting mix is then ready for coextrusion. In another preferred embodiment of the present invention, the core gum portion contains pure fructose syrup (also referred to as high fructose corn syrup) as a replacement for corn syrup. It was previously thought that it would be impossible to employ large amounts of pure fructose syrup in chewing gum because of high water absorption resulting in extreme sweating problems and sticking of the chewing gum to its wrapper. However, it has been found that where the high fructose gum is used as the core portion, the outer protective shell serves to prevent moisture from migrating from the core to the exterior surface of the coextruded gum. The high fructose core portion has a short-structure, that is, is easily torn apart, and will comprise gum base, pure fructose syrup, sweetener-bulking agent, such as sucrose, flavor and optionally additional plasticizer and color. In forming the core portion, the pure fructose syrup will be employed in an amount within the range of from 5 to 30%, and preferably from 8 to 20% by weight of the core. The fructose syrup will contain from 25 to 95% solids, and preferably from 40 to 90% solids, in the form of fructose. Alternatively, the core gum portion may contain fructose solids in amounts equivalent to that present in the fructose syrup, as described above. The high fructose gum portion may include a sweetener-bulking agent which will be employed in an amount of from 30 to 80% by weight, and preferably, from 45 to 70% by weight. Examples of sweetener-bulking agents which may be employed herein are set out hereinbefore with respect to other embodiments of core portions. The high fructose core gum portion may also contain an artificial sweetener, such as, for example, aspartame, cyclamate, or a saccharin or other sweetener as set out hereinbefore, the artificial sweetener being present in an amount of from about 0 to 0.5% by weight, and preferably, from 0.05 to 0.2% by weight. Other examples of artificial sweeteners suitable for use in the high fructose core are set out hereinbefore with respect to other embodiments of core portions. The high fructose core portion may be prepared by conventional gum making techniques. In a preferred method for making the high fructose core portion, gum base is melted and maintained at 82 to 93°C (180°F to 200°F). About 1/2 of the sweetener-bulking agent is mixed with the gum base to disperse same throughout the continuous mass of gum base thereby trapping the sweetener-bulking agent in the gum base. Thereafter, the flavor is added with mixing and the remaining sweetener-bulking agent is added with mixing thereby causing the mass to be torn apart into discrete pieces. The pure fructose syrup is added to the discrete pieces of gum base with mixing and other flavors including spray dried flavor may then be added with mixing. The mass, now smooth and continuous, is then ready for being cut into pieces and wrapped. It will be appreciated that the pure fructose syrup may be added before the second batch of sweetener-bulking agent is added, and/or as described above, after the second batch of sweetener-bulking agent. Preferred high fructose core formulations are set out below. The outer shell portion of the coextruded chewing gum of the invention may contain any of the sweeteners, flavors, bulking agents, gum base ingredients and other miscellaneous ingredients which may be present in the soft core portion and which are set out in detail hereinbefore. The chewing gum forming the outer shell portion itself may be prepared employing conventional chewing gum manufacturing techniques. A preferred chewing gum composition which may be employed in extruding the outer shell portion is set out below. The outer shell chewing gum portion may be prepared as follows. The gum base is first melted; thereafter the melted gum base is cooled to below 93°C, and preferably below 82°C, and softener, such as lecithin, is thoroughly mixed for about 1 to 3 minutes in the gum base which at this time is in the form of a continuous mass. Thereafter, from about 10 to about 40% by weight of the total amount of sweetener-bulking agent, which preferably is fine granular sugar, is mixed for 2 to 10 minutes with the continuous mass of gum base and softener during which time the continuous mass breaks up into granules or chunks. The corn syrup solids are then mixed with the granules for about 4 to about 6 minutes and then the remaining sweetener-bulking agent and flavors are mixed with the above mixture for 1 to 3 minutes to form a fine granular aerated discontinuous mass. Finally, the liquid sorbitol is added to the discontinuous mass and mixed therewith for 3 to 6 minutes to form a cohesive, but still discontinuous mass. Thereafter, if desired, solid flavor may be added and mixed with the gum base mix to form a chewing gum which is ready for extrusion. Preferred chewing gum formulations which are especially designed for both long-lasting prolonged sweetness and flavor release and also for initial burst of sweetness are set out below. These compositions may be employed in the outer shell portion. These chewing gums are disclosed in U.S. application Serial No. 953,291, now U.S. Patent No. 4,217,368. The above chewing gums may be prepared as described below. The gum base is first melted, emulsifier such as lecithin and second sweetener are thoroughly mixed, for at least two minutes, in the melted gum base (which is maintained at a temperature preferably not exceeding 93°C to effect uniform distribution and seal the second sweetener in the gum base. Flavors, food acids (where desired) are added and the mixture is mixed for from 1 to 2 minutes. The mix, at this time, is a continuous cohesive mass. At this stage auxiliary or first sweetener, preferably in particulate form, which may be another portion of the same sweetener as the second sweetener, or other sweetener, is added to the continuous mass with mixing being continued for from 1 to 5 minutes, thereby causing the continuous mass to be torn apart into discrete, separate masses of gum base containing second sweetener sealed therein said discrete masses being suspended in particles of first sweetener to form a heterogeneous mass. The aqueous plasticizer or softener is added to and mixed with the heterogeneous mass for from 1 to 5 minutes, and preferably from 1 to 3 minutes. Thereafter, the solid flavor, for example, encapsulated or fixed on dextrin or gum arabic, and water-soluble acids may be added and mixed with the gum mass to form a smooth chewing gum which is ready for extrusion. When the aqueous plasticizer or softener is added after the mix is in discontinuous discrete masses or clumps containing second sweetener sealed therein and suspended in the auxiliary or first sweetener, substantially all water from the aqueous plasticizer, such as sorbitol syrup, will be taken up by the water-soluble particulate auxiliary or first sweetener, and the water will not be available for solubilizing the second sweetener sealed in the gum base. The second sweetener initially added to the melted gum base to form a continuous mass will be substantially buried in the gum base and protected from any solubilization (for example, due to aqueous polyol syrup) even after the gum base mix is torn into discrete masses or clumps. It will be appreciated that substantially any conventional type chewing gum may be employed in forming the coextruded product of the invention. In forming the coextruded final product, regardless of the type of chewing gum to be employed, the chewing gum for each of the outer shell and core portions are fed through coextrusion apparatus such as is available from Turbo-Bepex (Hutt) Company or other conventional equipment, to form a core portion bonded to an outer shell portion, the core portion containing at least about 1.5% by weight flavor as described hereinbefore. The coextruded chewing gum product of the invention may take various shapes, and sizes, may be multi-colored and/or multi-flavored, that is, the core portion may be of a color and/or flavor different from the color and/or flavor of the outer shell portion. In addition, as indicated, different types of chewing gums may be employed in each of the core portion and outer shell portion to provide both initial burst of sweetness and flavor and thereafter prolonged sweetness and flavor. The following Examples illustrate preferred embodiments of the present invention without, however, limiting the same thereto. A coextruded cherry flavored chewing gum in accordance with the present invention is prepared as follows. The solids (A) and liquids (B) are mixed together and heated to 116°C with constant agitation to form a homogeneous mass. The homogeneous mass is allowed to cool by exposure to ambient air for 20 minutes to cause the sweetener solids to recrystallize and form an amorphous mass. The gum base is melted (71-79,5°C) and placed in a pre-heated standard dough mixer equipped with sigma blades. Color is added and mixed for 3-4 minutes. About one-third of the preformed amorphous sweetener mass is added and mixed for 1-3 minutes. Thereafter, another one-third portion of preformed amorphous sweetener mass is added and mixed for 2-3 minutes. The Maltrin is added and mixed for 1-2 minutes followed immediately with lecithin and flavor and mixed for about 2-3 minutes. The remaining preformed amorphous sweetener mass is added and the mixture mixed for 2-5 minutes. The chewing gum prepared above is now ready for extrusion. However, before extruding, it is found to have a pleasant sweet taste, good softness retention, a smooth texture and amorphous bite through and enhanced flavor, but is sticky and might be difficult to handle in a conventional gum wrapping machine. The gum base is melted (temperature 132°C) and placed in a standard dough mixer kettle equipped with sigma blades. The corn syrup and lecithin are added and mixed for 2 minutes at 93°C. At the time the mix is folding well, powdered free saccharin and powdered fumaric acid are added to the base-syrup mix and the mixture is mixed for 1 minute at 93°C. Thereafter, the sucrose, dextrose, flavor oil, citric acid, and coloring agents are added and blended with the above mixture for 5 minutes at 71°C. The resulting gum is discharged from the kettle and is ready for extrusion. Each of the above formulations is fed to a double rotary bar roll press model DDP Turbo International (Hutt-BEPEX) wherein a coextruded product is formed which contains a core portion having 6% moisture surrounded by and bonded to an outer shell portion. The so-formed coextruded product is formed into blocks which are easy to wrap, without having a wrapper removal problem, employing conventional wrapping apparatus. The coextruded gum is found to have an initial sweet and flavorful taste provided by the outer shell portion and thereafter a much prolonged level of flavor and sweetness provided by the core portion. Coextruded sugarless chewing gums are prepared from the following ingredients employing the procedure outlined in Example 1. The Examples 2 and 3 chewing gums are ready for coextrusion. Prior to extrusion, they are found to have a pleasant sweet taste, good softness retention, smooth and amorphous bite through and enhanced flavor; however, their stick properties do not allow them to be used in conventional wrapping equipment. The following sugarless formulation is employed as the outer shell in each of the Examples 2 and 3 products. Gum base is melted and maintained at a temperature within the range of 66 to 79.5°C (150-175°F). Softener is added and then the solid sugar alcohols are added slowly with stirring. Thereafter, liquid flavor is added and the mixture is stirred until homogeneous. Sugar alcohols are slowly added and then artificial and/or natural sweetener (where employed). Where spray dried flavors are employed, they are added with the artificial sweeteners. The above mixture is stirred until homogeneous, is cooled, and ready for extrusion. Each of the above formulations is fed to a double rotary bar roll press model DDP Turbo International (Hutt-BEPEX) wherein a coextruded sugarless product is formed which contains a core portion having 6% moisture surrounded by and bonded to an outer shell portion. A coextruded peppermint flavored chewing gum in accordance with the present invention is prepared as follows. A core gum portion base having the composition as set out below is prepared as described hereinafter. The gum base is added to a steam jacketed kettle equipped with a sigma blade mixer. The base is melted and adjusted to a temperature of about 82 to 93°C (180°F to 200°F). About one-half of the sugar is thoroughly mixed into the melted gum base (while the gum base is folding well) for about 3 minutes to disperse the sugar throughout the continuous mass of gum base. The sugar is thereby trapped in or otherwise protected by the gum base. Thereafter, the liquid flavor is added with mixing for about 1 minute. The remaining sugar is added with mixing for about 2 minutes thereby causing the mass to be torn apart into discrete pieces. The pure fructose syrup is added to the discrete pieces of gum base with mixing for about 2 minutes, and the spray dried flavor is added with mixing for about 2 minutes. The mass, now smooth and continuous, is removed from the kettle and is ready for coextrusion. The so-formed gum is found to be easily unwrapped and has a clean fresh taste, easy bite through, is soft and has improved flavor characteristics. An outer shell portion having the following ingredients is prepared as described below. The gum base is melted (71 to 79.5°C) (160-175°F) and placed in a standard dough mixer equipped with sigma blades. Lecithin is added and mixed for 1 minute. About 1/3 of the sugar is added and mixed for 1 minute during which time the gum base breaks up into granules. The corn syrup solids are added to the granules and mixed therewith for 2 minutes during which time the gum base granules are further broken up into more granules. The remainder of the sugar and the liquid flavor are then mixed with the aforedescribed granules for about 2 minutes to form a fine granular aerated discontinuous mass. Thereafter, the liquid sorbitol is mixed with the discontinuous mass for about 3 minutes to form a cohesive mass. Thereafter, the spray dried flavor is mixed into the mass to form a chewing gum which is ready for extrusion. Each of the above chewing gum formulations are formed into a coextruded product as described in Example 1, which product has an initial flavor and sweetness impact provided by the outer shell and a prolonged sweet and flavorful taste provided by the core. In addition, the coextruded gum may be easily wrapped using conventional wrapping machines and will not stick to its wrapper even during warm weather. 1. A coextruded chewing gum having a soft gum center portion, characterized in that it comprises an extruded soft gum core portion and an outer shell portion formed of chewing gum and extruded simultaneously with said core portion, said core portion formed of chewing gum containing more than 5 to 10% by weight moisture based on the weight of the core portion and containing therein a preformed recrystallized sweetener combination including at least two sweeteners which have been recrystallized as a mixture, dispersed as said recrystallized mixture in said gum base, said outer shell portion being bonded to said core portion to provide a support and protective barrier therefor to retain said moisture in said core portion and retard migration of moisture therefrom. 2. The coextruded chewing gum of claim 1 wherein said core portion comprises from 5 to 90% by weight of said coextruded chewing gum and said outer shell portion comprises from 10 to 95% by weight of said coextruded chewing gum. 3. The coextruded chewing gum of claim 1 wherein said core portion is present in a weight ratio to said outer shell portion of from 0.05:1 to 9:1. 4. The coextruded chewing gum of claims 1 to 3 wherein at least one of said sweeteners in said recrystallized mixture is sucrose, high fructose syrup, fructose dispersed in water, liquid glucose, corn syrup, sorbitol syrup, invert syrup, hydrogenated starch hydrolysate or mixtures of two or more of such sweeteners. 5. The coextruded chewing gum of claims 1 to 4 wherein said recrystallized mixture comprises from about 40 to about 85% by weight of said core gum portion. 6. The coextruded chewing gum of any of claims 1 to 5 wherein said recrystallized mixture comprises a mixture of one or more solid sweeteners and one or more liquid sweeteners which coat said solid sweeteners. 7. The coextruded chewing gum of claims 1 to 3 wherein said recrystallized mixture comprises recrystallized sorbitol and sorbitol syrup or hydrogenated starch hydrolysate. 8. The coextruded chewing gum of claims 1 to 3 wherein said recrystallized mixture comprises from 35 to 95% by weight sucrose, from 5 to 50% by weight high fructose syrup, from 1 to 30% by weight liquid glucose, from 1 to 30% by weight corn syrup, and from 1 to 25% by weight invert sugar, all of said percents being based on the weight of the recrystallized mixture of said core portion. 9. The coextruded chewing gum of any of claims 1 to 3 wherein said core portion is free of corn syrup and said core portion comprises gum base, pure fructose syrup, sweetener-bulking agent and flavour and containing no additional humectant, said fructose syrup being present in an amount from 8 to 30% by weight of said core portion. 10. The coextruded chewing gum of claim 9 wherein said sweetener-bulking agent is sugar or sorbitol in an amount within the range of from 30 to 80% by weight of said core gum portion. 11. The coextruded chewing gum of any of claims 1 to 4 wherein said core or outer shell portion is formed of chewing gum which provides fast flavour and sweetness release, while the other of said portions is formed of chewing gum which provides slow initial but prolonged sweetness or flavour release. b) a continuous rope of an outer shell portion completely surrounding said core portion so that said outer shell portion is bonded to said core portion thereby forming a protective barrier around said core portion which retards migration of moisture from said core portion to said outer shell portion. ES2188402B1 (en) * 2001-10-16 2004-10-16 Joyco Inversiones, S.A. Gum or soft caramel and method for generation. MX2007014635A (en) * 2005-05-23 2008-01-22 Cadbury Adams Usa Llc Center-filled chewing gum composition. BRPI0921865A2 (en) 2008-11-28 2015-08-04 Kraft Foods Global Brands Llc confectionery composition, article, method, and apparatus. EP2316279B1 (en) * 2009-10-30 2013-10-09 Intercontinental Great Brands LLC Sugar free confectionery; methods of making same; and use in preparing multilayered confectionery. Owner name: NABISCO BRANDS INC.